Here are two recent mani's I wore, both featuring Glimmer by Erica polishes. 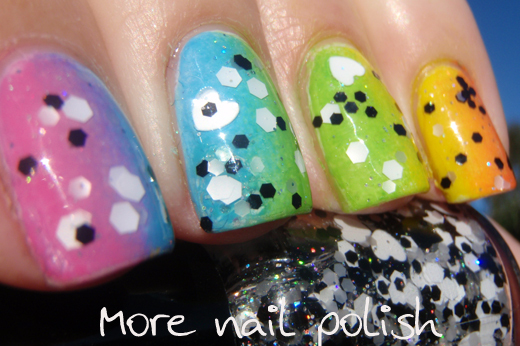 First up is a sideways rainbow gradient. I used Ulta3 polishes Mango Mayhem, Strawberry Sundae, Blue Heaven, Tahitian Lime and Frangipani, all sponged on over a base of Lily White. I then added a layer of Glimmer by Erica - 50 Shades of No Gray, which is a mix of black, white and translucent white hexes in two sizes and well as black and white hearts. I didn't have to fish out the hearts and I got two white ones on my left hand, and in a very rare right hand shot below you can see two black and one white heart. This polish also has a fine holographic shimmer to it, which is just perfect over a gradient like this. I must have been feeling very patriotic this day when I decided to go with green and gold nails. 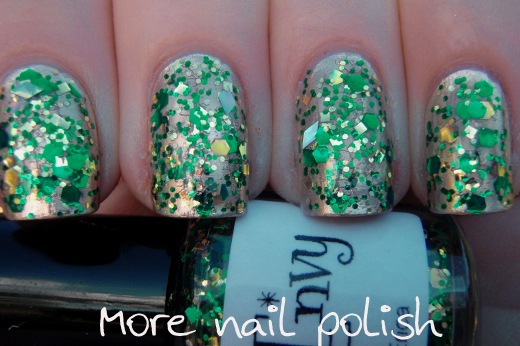 The base is Essie Good as Gold and the green glitter is Glimmer by Erica - Green with Envy. 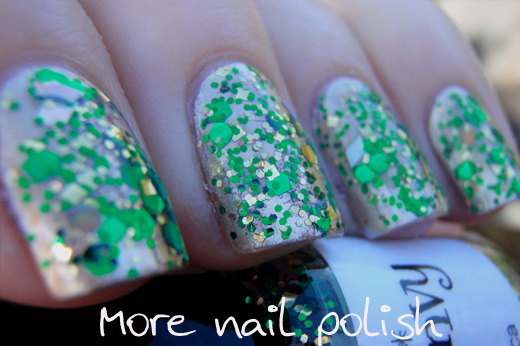 Green with Envy has different shapes and sizes of green and gold polish as well as some holo diamonds. Both these glitters were a dream to apply and all glitter pieces were smooth and flat. 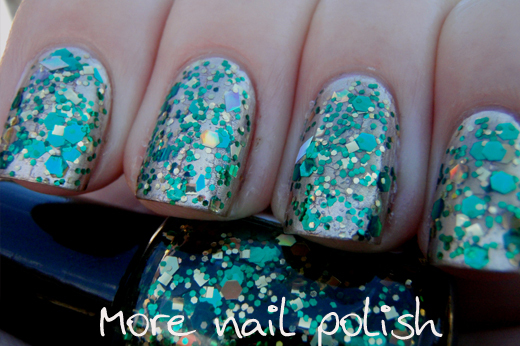 50 Shades of No Gray is definitely a layering polish, whereas you could probably get Green with Envy opaque on it's own. I used one wiped coats of 50 Shades and one dabbled coat of Green with Envy. Glimmer by Erica polishes are available from her Etsy store. 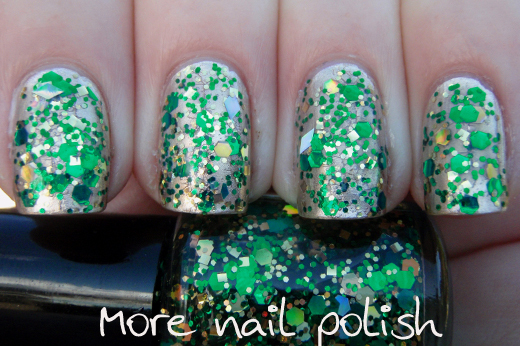 Glitter by Erica polishes in this post were provided for review. So pretty the gradient rainbow! 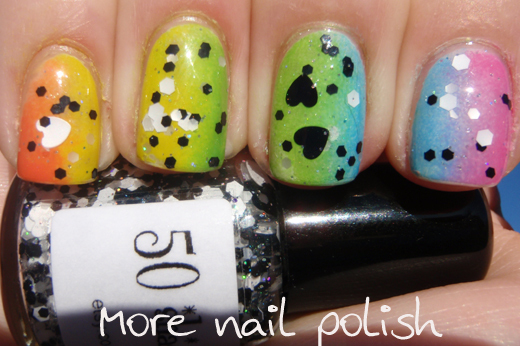 I really love that sponge mani with the heart glitter, it's so cute! Green with envy is also really nice, I'm really getting into buying polishes from Etsy these days! So addictive! 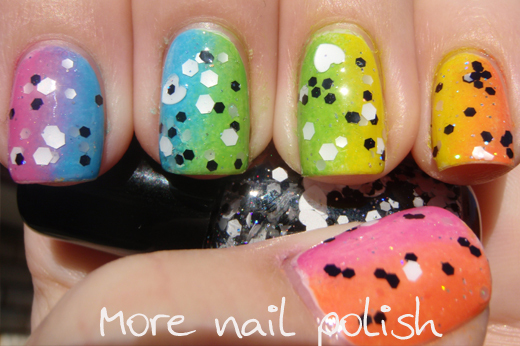 Your gradient mani's are just amazing! I would love it if you could post a "video" tutorial of you doing them. I attempted it myself by following your written instructions and it was an EPIC fail!!! I'll see what I can do with a video tutorial. Awesome, I look forward to it!!! Thanks so much! 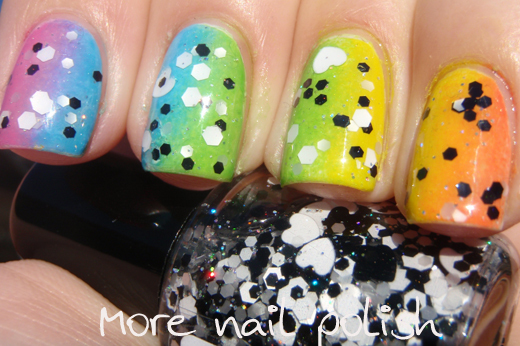 That gradient is gorgeous and I love it with the b&w glitter!